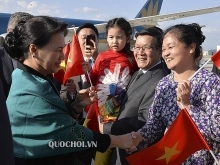 Speaking at the closing ceremony, permanent Vice Chairman of the Vietnam Journalists’ Association (VJA) Ho Quang Loi said the event affirms the strong development of revolutionary Vietnamese press and reflects its responsibility for the country and people. 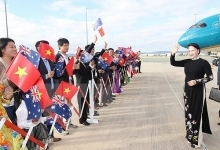 The organising board presented prizes in six types. There were 76 prizes for impressive stalls, 76 prizes for Lunar New Year cover pages, 20 prizes for interfaces, 43 prizes for impressive radio-television programmes for Lunar New Year holiday, and 23 prizes for scientific studies on press professionalism. Nhan Dan Newspaper won ten prizes at the festival, including the A prize for the interface, the B and C prizes for Lunar New Year cover pages, and five prizes for outstanding reportages on environment and climate change, of which, Nhan Dan Online won two C prizes in this category. Co-hosted by the VJA, the Party Central Committee’s Commission for Communications and Education, the Ministry of Information and Communications (MIC), the Ministry of Culture, Sports and Tourism, and the Hanoi municipal People’s Committee, the event displayed New Year publications, audio and television programmes, nearly 300 reportages on environment, climate change and disaster prevention, and over 80 articles on science and press professionalism. 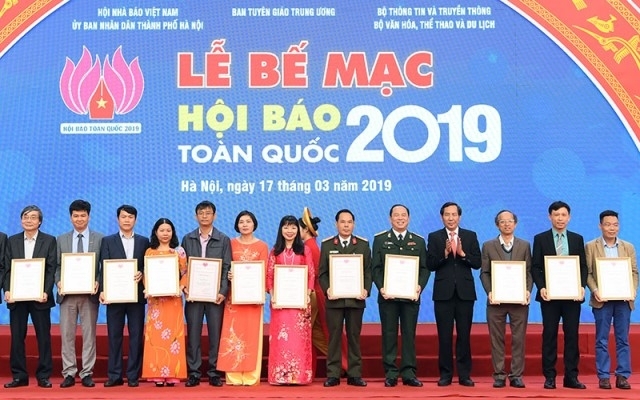 Among the highlights were displays on “Nhan Dan Newspaper with Party building” by the paper, “Most trusted news source” by VNA, and “Press with outstanding events of the country” by the MIC. Press photo exhibitions were also held.